you are new to GunDB you may want to check out my other article on the basics of GunDB. All the code snippets for this article are available on Gitlab. your own model or expand and improve the ones discussed. control, or using diagramming tools. teams can then turn into deliverables. refer to and update throughout the development life-cycle of a project. in designing the model for the entire app. A user can be a reader, author, publisher, or a combination of all three. Readers and authors can have profiles that they can use to share a little about themselves. Admins can perform administrative tasks, like creating books or managing publishers in the system. Readers can favorite books. They can create lists and add books to their lists. A book can be in multiple lists depending on what the reader chooses. They can also decide which list should stay private and which ones public. Readers can review books. They can rate a book from 1 to 5 and leave a review about it. They can submit reviews and have the reviews show up when visiting a book's details page. Readers can follow other readers. You can go to a reader's profile and see their followers and also the readers they follow. Readers can also follow authors. Similar to the use case above, you can see the authors they are following, and the authors that follow them. The idea is that anyone who uses the app, including anonymous users, can see the latest updates. For example, they can see the new books that have been added or the most popular books of the month and so on. Admins can add books and manage existing ones. Books should be added in a way that recommendations can be given to readers depending on what books they have liked or read. Now it's time to identify the entities, their attributes, and the relationships. In this section, we are going to think about how we are going to use the data. What titles, keywords, or categories that have been searched the most? Given two or more readers/authors, who are the followers/followings they have in common? and create a graph model to be specifically implemented for GunDB. diagram from the definition above. See Appendix 1 for more details. In this section, we are going to explore representing relationships with GunDB. 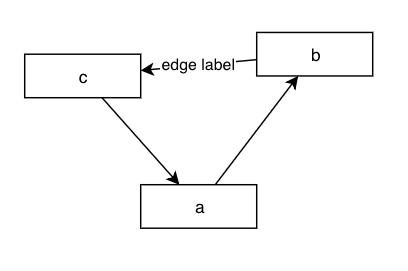 complete control when it comes to designing the graph model of your system. However, it's useful to use link nodes to describe properties for relationships. definition above. See Appendix 1 for more details. data to verify we get the correct data back. included in the article's repository on Gitlab. Now, that we have some fake data, let's go through creating the relationships. 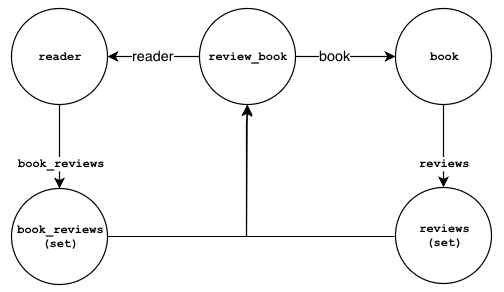 The review_book link node represents a reader reviewing a book. The book property in review_book references the book being reviewed. The reader property in reivew_book references the reader creating the review. The reviews/r set holds references to review_book nodes, grouped by rating. The book_reviews property in the reader node is a set that holds references to review_book nodes. 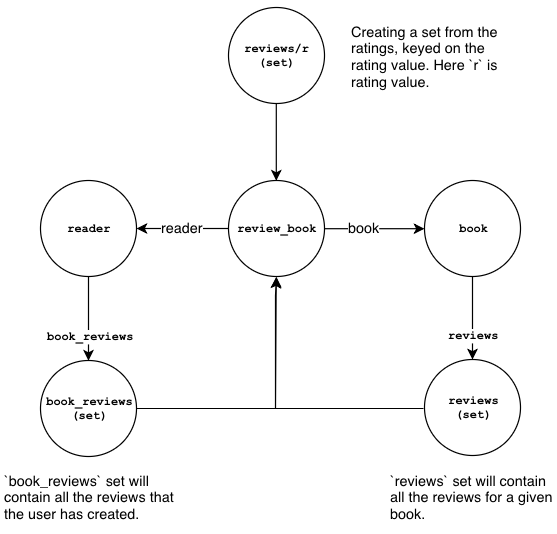 The reviews property in the book node is a set that holds references to review_book nodes. finally we return the review_book link node from the function. of the books and that works just fine. above to promises using the then extension. On line A we define a helper function to create a copy of an object and remove the "_" meta data field. On line B, we run a get query on book reviews created by a reader and start the chain promise. On line C, we use our helper function to remove the meta data and return a copy that only includes result keys. Promise.all takes the array of promises and resolves them to nodes. And finally on line E we log the data nodes. The author_book link node represents authoring a book by one or more authors. The book property in the author_book node references the authored book. The author property in the author_book node references an author of the book. The book property in the author node references a set that holds references to author_book nodes. The authors property in the book node references a set that holds references to author_book nodes. The book_list node represents a list that contains a set of books added by the reader. The books property in book_list holds the reference to the set of books. The favorite_books property in the reader node references a set that holds all the book_list node references. The book property in the publish_book node references the published book. 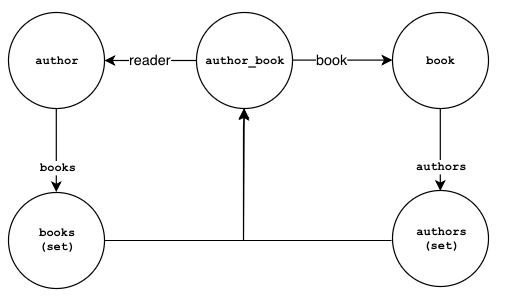 The publisher property in the publish_book node references the publisher. 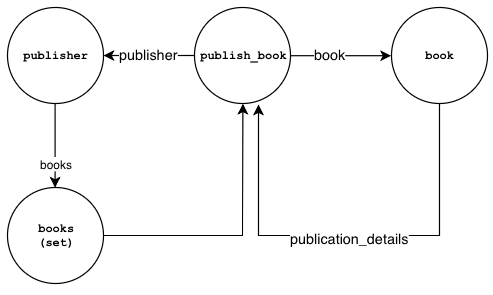 The book node contains a property called publication_details that also references the publish_book node. The publisher has a property called books that is a set holding references to the publish_book link nodes. 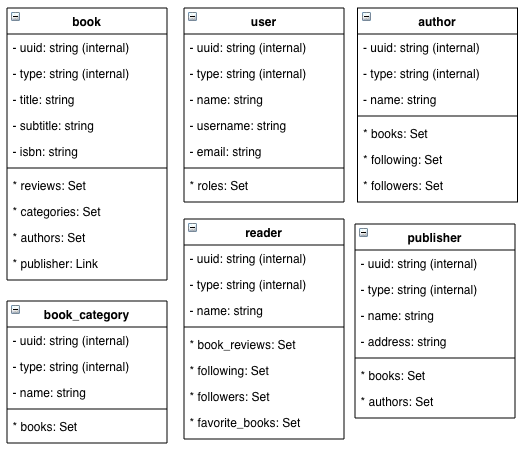 The book_category link node relates a category to a book. 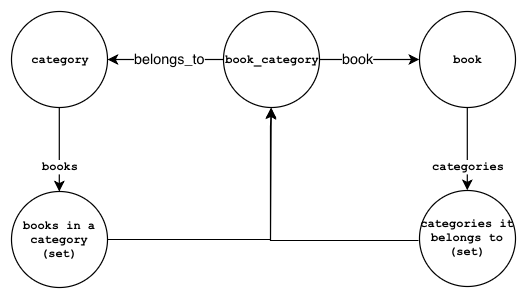 The belongs_to property in the book_category node references the category. The book property in the book_category node references the book. 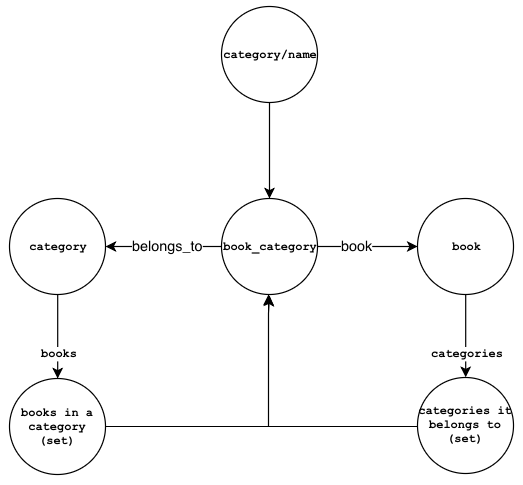 The category/name set holds references to book_category nodes. 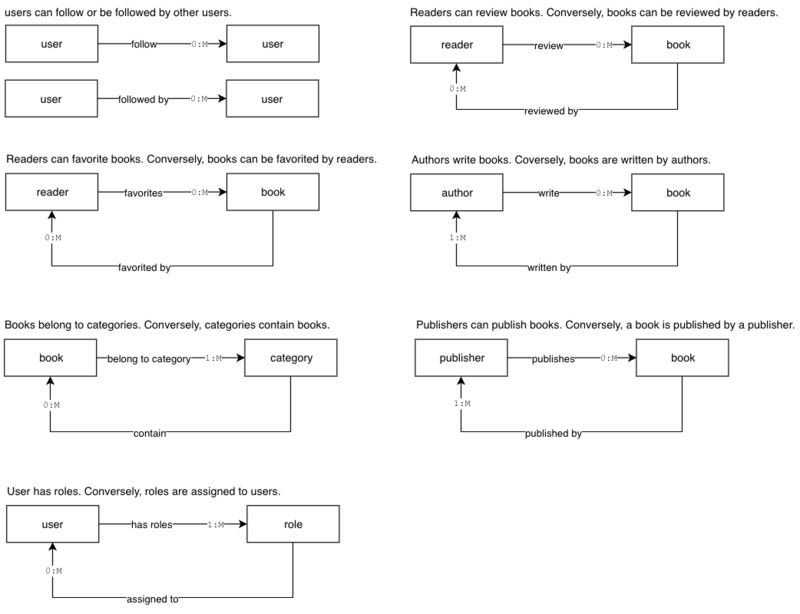 The books property in the category node is a set that holds references to the book_category link nodes. 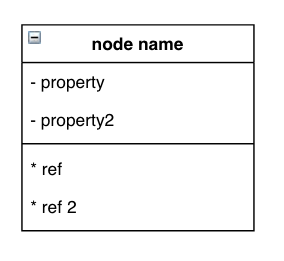 The categories property in the book node is a set that also holds references to the book_category link nodes. The role node link contains the role's information. Its user property references the user node and its assigned_to property references a user type node. 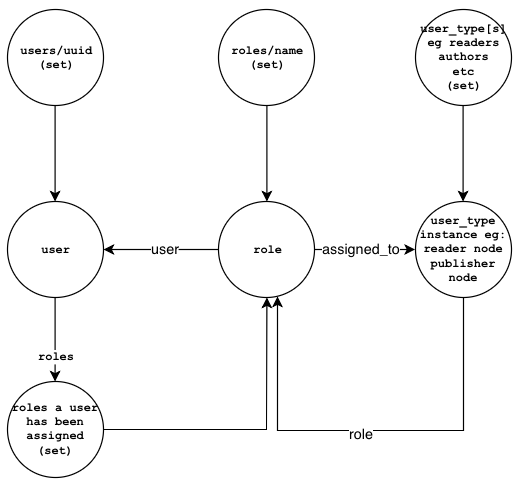 A user type node can be a reader, author, or publisher. 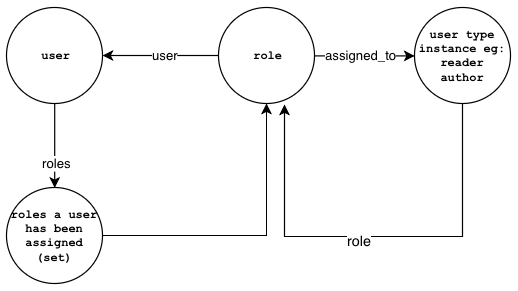 The roles property in the user node is a set that holds references to role nodes. The user type node has a role property that points to the role node. users/uuid: a set that holds references to users created. roles/name: a set that holds references to roles created. [user_types]: a set that holds references to user types created. For example readers, authors, publishers. for demonstration purposes only. Always use get to resolve data in Gun nodes. B, but that doesn't imply that User B is also following User A immediately. The follow link node represents a "follow" relationship between userA and userB. 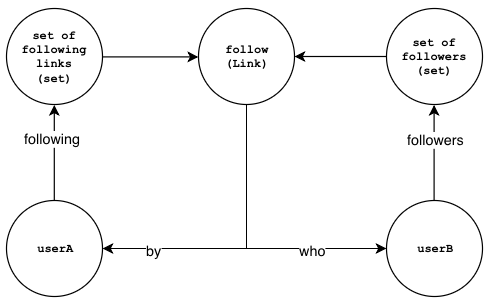 The who property in the follow link node represents the "destination" of the "follow" relationship. 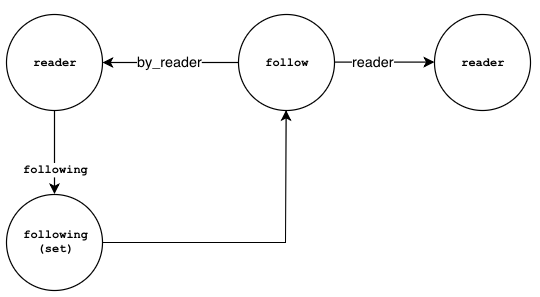 The by property in the follow link node represents the "source" of the "follow" relationship. The following property in userA is a set holding link references to follow nodes. 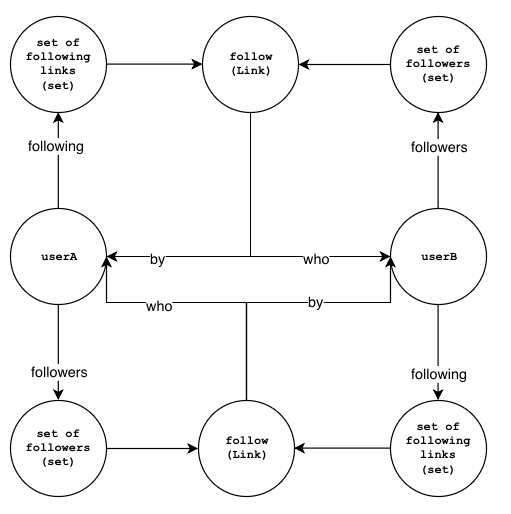 The followers property in userB is a set holding link references to follow nodes. been included in many favorite lists by readers, and also has five star rating. comparison to get to the answer that you're looking for. Using schema validation to enforce a structure before saving data. There is an extension called gun-schema that uses is-my-json-valid package behind the scenes to help you validate your object shapes. Creating scopes for your data. There is an extension called Reticle that helps you create scopes to avoid collisions between keys. Validating constraints before adding to the database is important if you want to make sure unexpected data is not added. In addition, you may also want to check uniquness if a relationship requires it. Using GraphQL is one way of establishing a data protocol between clients and a system's backend. Using GraphQL the clients can ask what they need and not worry about the details of the backend. You may want to look at the Graphql-gun package which is a graphql API for GunDB. And please join the GunDB chat room if you have any questions or if you are not sure about something, everyone is very friendly and helpful. the features that you would expect from a diagramming tool. everything was documented only by PDFs or images. You can use the same method for creating graphs. But instead of choosing "List"